As far as insects go, dragonflies aren't a dangerous species to have buzzing about your yard. Dragonflies don't pose a danger to humans, they can eat true insect pests and they attract birds to your yard. If, however, the sheer number of dragonflies in your yard is a nuisance, there are several ways to get rid of them without resorting to pesticides or killing the bugs. Dragonflies tend to congregate near water. Because killing dragonflies is usually completely unnecessary, a better idea is to make your yard less attractive to them. For example, dragonflies eat mosquitoes, and taking steps to eradicate them from your yard can deter dragonflies from taking up residence. Preventing water from pooling in low spots in your yard is one way to reduce the mosquito population. Taking proper care of your garden is essential, too. Dragonflies feast on many insects that can damage flowers and vegetables, so watering and caring for the plants properly can prevent pests from invading your yard to begin with. 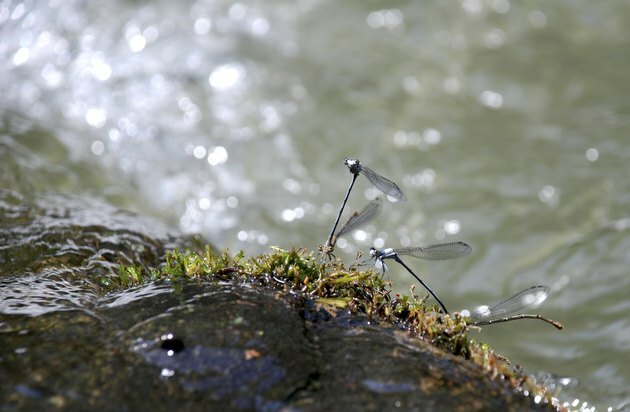 If these bugs aren't present, chances are that the dragonflies will go somewhere else. Dragonflies are attracted to water, so if you have a pond, creek or stream in your yard, you're also likely to have dragonflies. Even if the water source isn't directly in your backyard, but you live near a lake, you might see dragonflies in your yard regularly. If you're determined to get rid of the winged insects, getting rid of these water sources, if possible, can help. Introducing predators into your yard can help you get rid of dragonflies in a more natural and life-cycle sort of way. 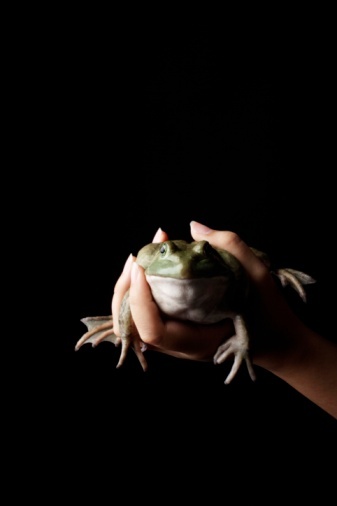 For example, frogs eat dragonflies, so bringing the amphibians into your yard can help take care of the problem. If you have a water source, such as a pond, that you don't want to get rid of, consider putting fish in it. Some types of fish eat dragonflies, as well as dragonfly eggs and larvae. Making your yard attractive to birds can also help as several species eat dragonflies. If you have a backyard pond, clean it regularly, which will prevent dragonfly larvae from developing into full grown insects. Dragonfly nymphs are usually located on underwater foliage, according to the National Wildlife Federation, so taking these plants out can help, too. Keeping the area around a water source that you can't get rid of clean and clear might reduce the number of dragonflies, as well. The insects need areas to perch, and if there isn't anywhere to do that, they'll likely seek out another area to live. Increasing human activity in areas where there are numerous dragonflies is another potential way to cut down on the dragonfly population.